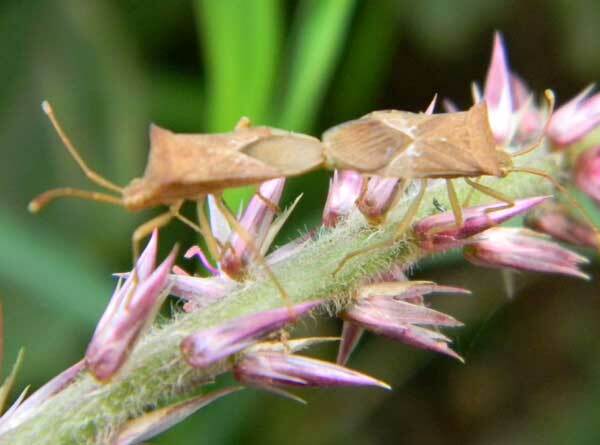 A number of these leaf-footed bugs were found feeding on seeds of a weedy amaranth in a Nairobi Garden. Kenya, April, 2011. All True Bugs such as Leaf-footed Bugs have specialized mouthparts for taking liquefied food. With sharp stylettes they pierce straight into tissue and with a powerful pump remove fluid. Leaf-footed bugs focus their feeding activity on fruits and developing seeds. This feeding often causes the seeds to be infertile or to become infected with bacteria or molds. If the host is a crop for food, the farmer is not happy of course. 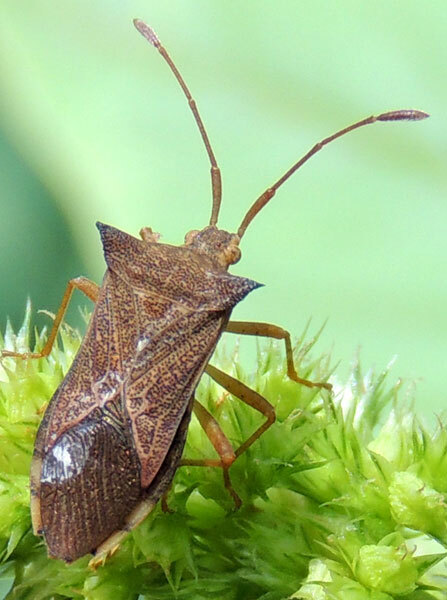 But in the case shown at left	the bug is feeding on seeds of a troublesome weed, meaning less vigorous weed germination. Most leaf-footed bug species (there are many) have a flared leaf-like process on the third pair of legs. In some species only the male has the leaf-foot. This species breaks the trend in that both male and female lack the characteristic leaf. Many bugs remain en copula for many hours - or longer. This species might be related to Clavigralla. 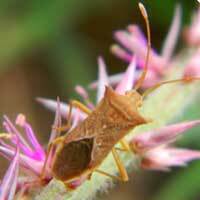 Leaf-footed Bugs sometimes feed on a variety of plants and may move from one type to another as the season progresses. The bug above was found on Amaranthus in Kitale. It is possibly a darker color-morph of the same genus or species.